California-based trainers John Sadler and Michael McCarthy were back training the two favorites for Saturday's $9 million Pegasus World Cup Invitational (G1) before daylight the morning after attending Thursday night's Eclipse Awards dinner in Gulfstream's Sport of Kings facility. The Sadler-trained Breeders' Cup Classic winner Accelerate, voted champion older horse and runner-up to Triple Crown winner Justify as Horse of the Year, is the 9-5 morning-line favorite in the $9 million Pegasus. The McCarthy-trained Breeders' Cup Dirt Mile winner City of Light is rated second at 5-2 in the 1 1/8-mile Pegasus. Both horses are making their last start before heading to stallion careers at Lane's End Farm. Accelerate's 6-for-7 campaign in which he swept four Grade 1 dirt races for older horses would have earned Horse of the Year in many years. But Sadler said he and owners Hronis Racing were prepared for Justify to take Horse of the Year honors, just given the cache of an unbeaten Triple Crown winner. Still, there was a lot to celebrate as Kosta and Pete Hronis, the brothers who race as Hronis Racing, were voted Eclipse Award-winning owners. 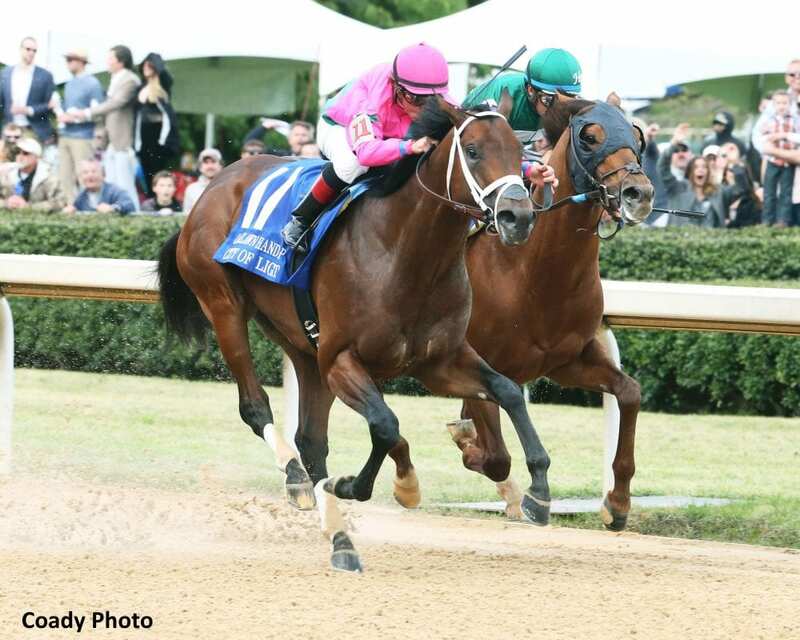 City of Light last year was the only horse to beat Accelerate, winning the Grade 2 Oaklawn Handicap by a neck, with Accelerate turning the tables in the Grade 1 Gold Cup at Santa Anita. This entry was posted in NL List, Pegasus World Cup and tagged accelerate, Breeders' Cup, city of light, Gulfstream, hronis racing, Javier Castellano, joel rosario, john sadler, lane's end farm, michael mccarthy, Oaklawn Handicap, pegasus world cup by Press Release. Bookmark the permalink.